Camera geeks are a needy bunch. They all have their opinions and won't hesitate to shout at manufacturers to include their pet requests. But that doesn't mean all those requests are good ideas. Here are five commonly desired camera features that are better left to the trash heap of design. If I had a dime for every compact camera review with "doesn't have a viewfinder" listed as a negative, I would be a damn rich man. Electronic viewfinders are great, but only when they are good electronic viewfinders, and only when they exist on a camera big enough to put up to your face. Sony's recent RX100 Mark III made a big to-do about listening to their customer feedback and cramming an EVF onto the tiny body. The problem is that the EVF isn't very good, and the camera is awkward and ridiculous looking when held up to your eye. Sure, it helps sometimes in bright sunlight, but the premium you are paying for that small advantage isn't worth it. There is one proper color for a camera, and that's black. You can't blame someone for wanting to look stylish with their new camera, but really, the only good style is black. Silver cameras are meant to stand out, exactly what you want not to do as a photographer. Unless you are rocking a film camera more than 30 years old, there's no reason to have a hunk of shiny silver slung around your shoulder. Tiny cameras are great because they're tiny. Interchangeable lenses make them very very not tiny. A camera like the Panasonic GM1 is a cool concept, but once you put any other lens on it besides the pancake kit lens, its main advantage is no longer. Then you have something like the Samsung NX Mini. It's a tiny camera that has a whole system of tiny lenses! Cool, except people that people who buy the NX Mini—geared toward beginners in almost every way—don't want the hassle of buying and changing lenses (which aren't very high quality to begin with). People cling to optical viewfinders religiously. It's true that they provide unrivaled clarity over electronic counterparts, but that's pretty much it. They make a camera heavy and bog it down with complex mechanisms. 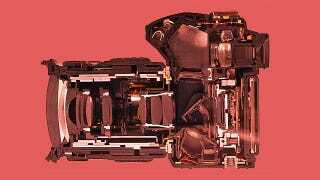 More modern EVFs found in mirrorless cameras like the Olympus OM-D E-M1 or Sony a6000 allow you to shed the weight while giving you the ability to see exactly what your exposure is before you take a picture. The most recent generation EVFs have astounding resolution and clarity, making it easier than ever to ditch the pentaprism. Retro styling has come to dominate camera design in the last few years. Some of these are just gorgeous, but when it comes to controlling your camera's settings, brands like Fujifilm can get a bit carried away. Take their recent X-T1. The classic looking dials just don't provide the super-fast access that lets you change settings efficiently. Just because it worked on a 40 year old Leica, doesn't mean it suits a modern digital device.